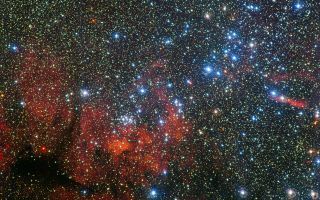 This colourful new image from the MPG/ESO 2.2-metre telescope at ESO's La Silla Observatory in Chile shows the star cluster NGC 3590. This colorful space wallpaper from the MPG/ESO 2.2-metre telescope at ESO's La Silla Observatory in Chile shows the star cluster NGC 3590. These stars shine brightly in front of a dramatic landscape of dark patches of dust and richly hued clouds of glowing gas. This small stellar gathering gives astronomers clues about how these stars form and evolve — as well as giving hints about the structure of our galaxy's pinwheeling arms.